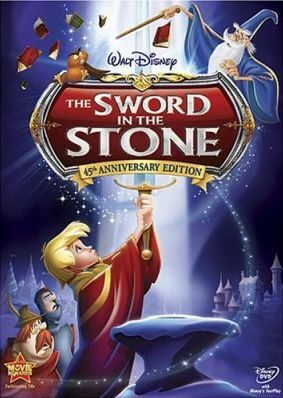 Walt Disney's The Sword In The Stone is one of the Disney movies I remember watching on the Disney channel as a kid, though that was many years ago, and my memory was more than a little fuzzy on the whole thing. So now that Disney is releasing a 45th Anniversary Edition, I though it would be a good opportunity for us to become reacquainted. And let me tell you, when I hear the title The Sword in the Stone , my story found within this movie is not what my imagination conjures up. This movie is more a boy learning about the world around him, and not about him pulling a magical sword from a stone, making him king, and having an adventure learning about his new found power. The story basically begins with young Author, the boy who would eventually be king. He lives under the care of another family, Sir Ector and his son, Kay, aren't the nicest people in the world, especially to Wart (as they call Author), but young Author keeps an upbeat attitude and genuinely attempts to please them as best he can. One day, Author accidentally causes Kay to miss his mark as he was shooting an arrow, so Author rushes into the forest to retrieve the lost projectile. As he fares deeper into the forest, a wolf beings to take notice, though Author remains oblivious, and as luck would have it, Author falls through the roof of Merlin's home before the wolf ever gets a chance to sneak a taste of the young boy. Merlin, the wizard who needs no introduction, was expecting Author, though he knew not exactly who Author would be, just that a young boy would be dropping in at that specific time at that exact spot. So once Author falls into the perfectly placed chair that Merlin sets up, the two get to know each other a little better over some chit-chat, and the wizard decides to help further the boy's education. Of course, this means Merlin will have to move in with Sir Ector and family, which leads to a song where Merlin uses his magic to make everything in his little home come alive and start packing themselves in his little carry bag. Once back at Author's home, Sir Ector reluctantly agrees to let Merlin stay and teach the boy, though it's out of fear that Merlin will cast some evil spell than it is him wanting to see Author get a good education. Ah, but Merlin's lessons aren't the typical boring classroom stuff... oh no, Merlin teaches by turning Author and himself into animals! First lesson: how to be a fish. As a fish, Author learns how to not be eaten by a much bigger fish... okay, so the lesson is really about how think on his feet (or fins, in this case), how to outwit someone who is bigger and stronger. The next lesson comes in the form of a squirrel... literally. This lesson starts out with learning how to look before you leap, but quickly turns into a lesson of love when female squirrels inter into the mix. When the wolf from earlier reappears and nearly eats young squirrel Author, the female squirrel that took a fancy to him risks her life to save him, thus helping the boy to understand the true power of love. And when the pair transforms back into their human selves, Author also learns about what it means to break one's heart when he sees how devastated his four-legged admirer is. The final lesson finds Author transformed into a bird, but instead of Merlin also transforming, his sidekick, an owl named Archimedes takes over. Here Wart learns to fly, but he also learns what overconfidence can lead to when he ends up being chased by a hawk. A narrow escape takes poor Author straight into the home of a witch The Magnificent Marvelous Mad Madame Mim. She tries to persuade Author that her magic is better than Merlin's, but when he won't bite she decides that she'll just have to kill the runt. Luckily, Merlin steps in, and the two have a wizard's duel. So by this point it's all pretty clear that the story has nothing to do with the sword in the stone, but eventually Author does get around to pulling it out and becoming king. Unfortunately, we don't get to see what happens after that. He is in his thrown room and doesn't know what to do, when Merlin shows up and tells him how he'll be a great king and leader of the Knights of the Round table. And then that's it. End of movie. I think probably the best thing in this film is the wizard battle between Merlin and Mad Madame Mim. The two constantly transform into various animals, each trying to outwit the other. It feels very smooth and effortless, yet holds the tension nicely. I also found it strange how Author's voice seemed to change at random times. I though maybe the voice actor had some rough days or something, but upon further investigation I learned that it was because there were actually multiple voice actors for the part. Don't ask me why. There were also a couple of good classic cartoons put on the disc as extra features, one involving Goofy and one involving Mickey, with both having a medieval theme to them. There were a few other extra features, such as Merlin's Magical Academy Game, but none were really significant enough to be worth going into detail about. So overall, I'd say this is a decent entry in the Disney library, but nothing I would call special.